At Campbell Scientific, we want to help you get the most out of your data logger that you can. You may have purchased your data logger to be the core of your data acquisition system without knowing all the things your data logger can do for you. For example, do you know what all the different terminals, ports, and connection options on your data logger can be used for? In this blog article, we’ll introduce you to the various parts of a data logger wiring panel, so you can maximize the benefit you receive from your data logger. In future blog articles, we’ll take a more in-depth look at some of these parts. The wiring panel of a data logger provides terminals for connecting sensors. These terminals enable the data logger to measure, communicate with, and power your sensors. Depending on the size and sophistication of the data logger, the quantity and types of input connections it offers for sensors will vary. Note: Different sensors produce different types of signal outputs. For your data logger to interpret the sensor signal, the signal output from the sensor must be compatible with the data logger input terminal to which it is connected. Analog inputs include both voltage and current inputs. Analog inputs can be configured to make single-ended measurements (measuring the input’s voltage with respect to ground) or differential measurements (measuring the voltage between two inputs). Pulse counters are used by the data logger to record the number of times that something happens. For example, pulse counters are used to measure switch closures, low-level ac sine waves, or high-frequency pulses. Pulse counters sum the number of counts over each execution (scan), allowing variables such as velocity, flow, and rainfall intensity to be determined. Switched voltage excitation outputs provide programmable voltage excitation for resistive bridge measurements. Additionally, these terminals can be configured to supply a regulated 3.3 or 5 Vdc power source to power sensors or toggle control lines. By default, digital I/O (input and output) ports are configured as binary inputs to perform functions such as detecting status or reading measurement expansion peripherals. In addition, you can individually program each port as a control output to physically control an external device. Communication ports are used to enable data transfer between your data logger and various smart sensors. The communication protocols used may be RS-232, RS-485, or SDI-12. Continuous 5 V terminals are regulated power sources for your sensors and other peripheral devices. The 12 V terminal is generally used as an unregulated continuous power source for your sensors and other devices. A switched 12 V terminal is used to power your external devices, such as sensors, that only require power during measurements. You can also use a switched 12 V terminal to switch power to your communication device during scheduled transmission intervals, thereby conserving power. The ground lug connects your data logger to earth ground. Data loggers are connected to earth ground to protect them from nearby lightning strikes by shunting transient voltages away from electronics. This also protects from electrostatic discharge and helps assure noise-free analog measurements. A power connector provides screw terminals for connecting your data logger to the wires of its power source. For example, the power connector can be used to connect a 12 V battery. On some data loggers, you can also connect a 16 to 32 Vdc charging source (such as a power converter or solar panel) to your data logger. A data logger may have an Ethernet port, which is typically used for IP communications with Campbell Scientific software such as LoggerNet and LoggerLink. In addition, it can be used to connect to an Ethernet-enabled camera or sensor. A memory card port on your data logger enables you to do the following: save your data logger internal memory to a card (such as a CompactFlash card or microSD card), easily transport it, and upload your data using a memory card reader. You can upload your data to a computer at an offsite location. Then, your data can be processed for visualization, analysis, sharing, report generation, and permanent storage. In addition to transferring measurement data, you can use memory cards to transfer your digital camera images, data logger programs, and data logger operating systems—without the need for a computer connection. 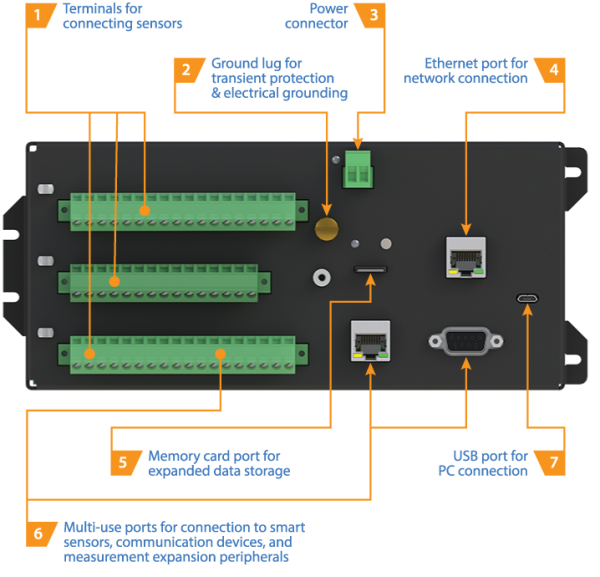 Multi-use ports are used to connect your data logger to smart sensors (that have internal measurement and processing components), communication devices (such as cellular or radio modems), and measurement expansion peripherals. A micro USB port is primarily used for data logger programming and testing. In the absence of an external power supply, the USB connection to a computer also supplies 5 V power to the data logger, which is adequate for configuration and making some measurements. If Ethernet or wireless data transmission is not feasible, you may need to rely on an onsite transmission option, such as a USB cable connecting your data logger to a desktop or laptop computer. We hope this article has introduced you to the various parts of a general-purpose data logger so that you can get the most out of your data logger that you can. In future blog articles, we’ll take a more in-depth look at some of the parts of the data logger wiring panel. In the meantime, let us know if you have any general data logger wiring panel questions. Please post your questions and comments below.